Prometheus was the son of Iapetos and Klymene. His name means ’Forethought’. Prometheus alone, he punished the entire world for the effrontery of this rebel god. Zeus against the devising Kronos, but Prometheus never had true respect for Zeus. took pity on the primitive mortals and again, he deceived Zeus. seercraft, signs in the sky, the mining of precious metals, animal sacrifice and all art. the torn flesh would mend so the eagle could begin anew at the first touch of Dawn. 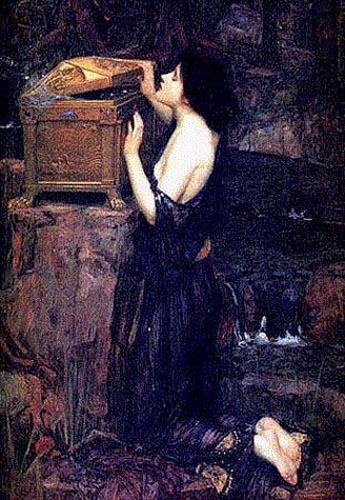 young girl and called her Pandora. Her name means, ’giver of all’ or ’all endowed’. head and Hermes put pettiness in her tiny brain. She was ready for the world. on the other hand, was immortal. His torment would last forever. The journey of Io was crucial to the release of Prometheus from his bonds. the mountain, killed the eagle and freed Prometheus from his shackles. "Mythica" is being comprised of three feature films and a follow-up TV series.